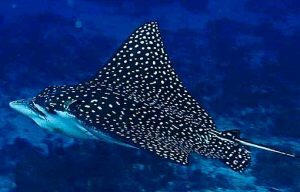 Spotted Eagle Ray is a species of cartilaginous fish belonging to the Myliobatidae or Eagle Ray family. They are one of the most beautiful Ray species in the world. Their interesting behavior patterns and peaceful nature separates them from many other species of this family. 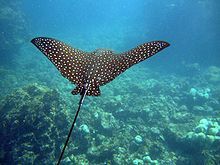 They have various common names such as white-spotted eagle ray, bonnet ray, duckbill ray, bonnet skate and spotted duck-billed ray. Size: Adult Rays of this species can grow up to 16 feet (5 meters) in length including their long tail. 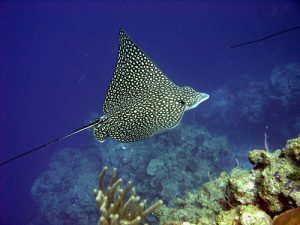 Young Spotted Eagle Rays measure between 17 cm and 35 cm in width at the time of birth. Wingspan: They generally have a 9 feet wide wingspan. The largest Spotted Eagle Ray has been recorded to have a wingspan of 10 feet (3 meters). Weight: This species of fishes generally weigh between 180 kg and 225 kg. The largest Ray of this species weighs around 230 kg (507 pounds). Color: The color of their dorsal side ranges from black to dark blue or grey. This side is covered with white, pearly and pale yellow dots and rings. Some of the larger rings have a black center. The underbelly or ventral side is off-white. Their tails have a white base. Body: Like other Rays from the Myliobatidae family, this species has a flat disk-shaped body. They have a pair of pelvic fin just before the tail. Snout: Their broad and flat snouts resemble the bill of a duck. Tail: They have a long whip-like tail with 2 to 6 venomous, barbed stingers attached to its base. Mouth: These fish have rows of flat broad teeth combining to form a kind of plate in both their upper and lower jaws. They have 6 to 7 papillae situated at the roof and 6 more situated on the floor of their mouth. This species is found in the tropical waters. Their distribution range includes the Gulf of Mexico, Atlantic Africa, Hawaii, Oceania, the Indian Ocean as well as the coasts of both North and South America. They can also be found in the marine waters of northern Japan, Australia and the Galapagos Islands. These Rays inhabit shallow coastal waters near bays and coral reefs. They frequent at 80 meters depth of marine water and sometimes also near the ocean surface. Their preferable water temperature ranges between 75 °F and 81 °F (24 °C and 27 °C). This carnivorous Ray species usually feed on bivalves, crabs, shrimps, mollusks, whelks and various smaller fishes. These creatures swim in tight groups or schools with all the individuals swimming in the same direction at the same speed. But occassionaly they are also found swimming in isolation. This species is known to be able to travel long distances in a day. They prefer swimming in open waters. 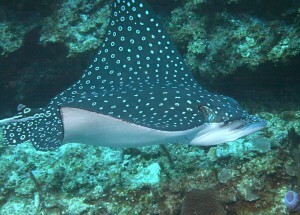 Sometimes they swim around in loose groups of 3 to 15 Rays without much interaction between them. They are more active during high tides. With the help of their flat snouts they dig in the sand and surround themselves by a cloud of sand spewing it from their gills. Sometimes they move their abdomen and pectoral fins rapidly to display two types of motions known as the pelvic and extreme pelvic thrusts. These Rays often dive in the water and come back up quickly. 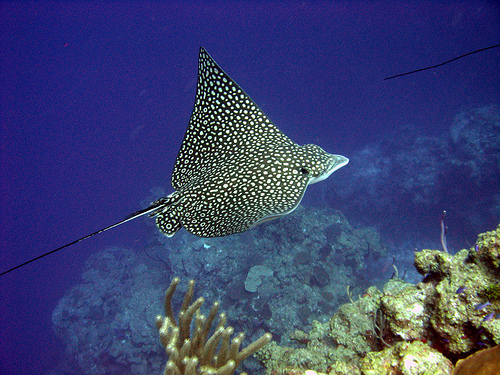 Spotted Eagle Rays are often seen leaping out of the water, especially when they are chased. They make a loud sound when captured and taken out of the water. This relatively shy Ray species usually avoids human contact. Various large shark species including the bull shark, tiger shark, silver tip shark and the great hammerhead shark are known to feed on this species of ray. 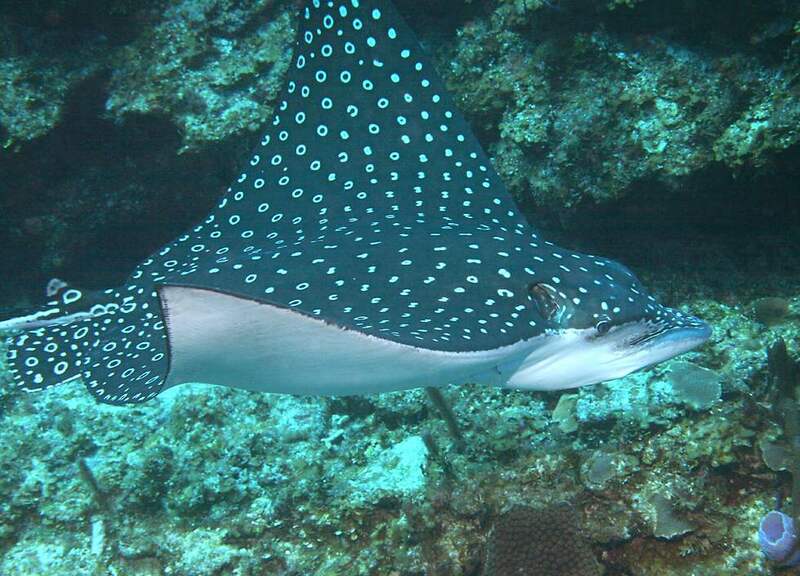 The sharks sometimes follow female Spotted Eagle Rays to feed on their newborn offspring. Their special tooth structure and well developed calcified struts help them break the hard shells of mollusks and feed on them. They use their venomous spines for defending themselves from predators. Their poisonous barbs can poison other large and small animals and fishes. Their flat body helps them to swim near the bottom of the ocean looking for preys. Like all other Ray species, their eyes and spiracles are located on top of their head enabling them to see and breathe (absorb water for gill-ventilation) while partly buried in sand. The male Rays of this species pursue the females during the mating season. Once the male catches up with the female, it inserts its clasper into the female Spotted Eagle Ray. Their mating process takes 30 to 90 seconds to complete. Females of this species are known to mate with more than one male during a single mating season. This ray species is ovoviviparous, meaning their eggs develop and hatch inside the body of the female rays. The gestation period of this species lasts for 1 year. A female gives birth to 2 to 4 young Rays during each reproductive season. They attain reproductive maturity at 4 to 6 years of age. The exact lifespan of this specie is unknown. They are thought to have a lifespan of 15 to 20 years. Their whip like tail can grow two to three times the length of their disc shaped body. They do not have any caudal fin. These fish are sometimes captured as game fish. A female of this species mate with many males during a single reproductive season. This Ray species is included in the “Near Threatened” category by the IUCN. They are often captured for commercial purposes to be displayed in public aquariums.It has been given various protections in many countries to help the species survive. Here are some images of this gorgeous ray species. You helped me learn about spotted eagle rays thank you.